Inspired by the music Grand Kalle et l’African Jazz, we are proud to bring you the bernos Afro Jazz, featuring African Jazz musician playing the Sax with African motif. Presenting bernos Afro Jazz concept in Silver American Apparel Shirt only $23.95. As seen on K’naan’s : T.I.A video, this shirt is back by popular demand. Make sure that you get it before we sell out. Presenting the bernos Made in Africa II, now available in Navy Blue American Apparel Shirt only $22.95. Bringing back our most controversial shirt and ironically, the people’s choice. A common thread amongst bernos lovers, bloggers & supporters is that most of us hail from Africa. Bernos believes and stands for Africa. 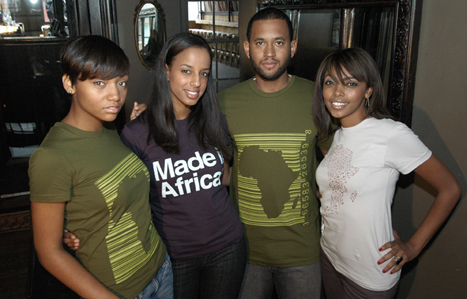 This is a way for us to pay homage to Africa. The Bernos Afrocode is now available in Olive Green American Apparel Shirt only $22.95. - Our models: Seward, Adiam, Janic, and Hayat. Thank you for coming out on that rainy Saturday and for your patience throughout the process. - Make up artist Lori: We recommend her for any events you may have. -Marvins: for letting us use your facilities and accommodating our needs. -Nana Boutique: Thank you for loaning us your fabulous jackets and other accessories. YOOHOOO!! LOVE THEM GUYS. Afro Jazz is beautiful! Hope am the first to get my orders in too!! I want to thank Everyone from Bernos staff! from Dawit to Nowali to… for inviting me out to do the makeup artistry for the fall photo shoot! and all of the beautiful models,Seward, Adiam, Janic, and Hayat that participated in the fall shoot! you all did wonderful! And i hope to work with you all again! I have been wearing the Bernos afrocode in olive green around town and people Love love love it!!! and i can also be found on weddingwire.com under health&Beauty in the DC area. under Makeup Aristry By Lori. But i always enjoying working with Bernos! they are the best of the best!!!!!!! I love the new tees!! Great job guys! why afro code tee looks brighter this time? I can’t order for the second time guys……. what about Bekla…tee..? am i the only one who need that tee??? loving the interor of the the house…great mErcha!! Great – I should certainly say I’m impressed with your site. I had no trouble navigating through all tabs as well as related information. The site ended up being truly easy to access. Nice job. A Super Easy Secrets To The Purchase Of A Leather Jacket. Leather jackets are getting to be an increasingly modern article of outfit to enjoy within your wardrobe. I was fantastically delighted to find this website. I sought to thank you for your calculate representing this magnificent post!! I beyond doubt take pleasure in rendition it and I have you bookmarked to ensure absent new pack you blog post. Thanks for sharing your thoughts about tshirts.